BBQMyWay.com is not intended for the casual weekend griller. Wait. Those are the people who need my help! If firing up a grill now and again is your definition of BBQ,...we need to talk. Better yet, you need to become a frequent visitor to this website. I as your Pit Boss encourage you to pour your favorite beverage and pull up a chair, if and ONLY IF you have a burning desire to learn this true American art. Simply put, BBQ has been a fascination of mine since I watched my dad grill steaks as a kid. That's back when I thought grilling was BBQ. I also worked as a cook (steaks, shrimp, burgers, etc.) at one of the nicer restaurants in my home town, starting at the age of 14. I now manage a sports marketing company that focuses on professional golf, but have been involved in the creation of a number of sauces and rubs. Hot tomato and mustard sauces, as well as steak, pork, seafood and poultry dry rubs to be specific. A few years back I built a southern-style brick BBQ pit at the back of my house that is a traditional, all-day culinary adventure in slow cooking over low heat. I use hickory coals that I render down myself in a fireplace. Hickory logs turn into hickory coals. Sorry, no wood pellets for me. Totally against my BBQ Religion. I don't want to risk slow cooking in BBQ Hades. I BBQ 20 to 40 pounds of meat at a time, including pulled pork, beef brisket, pork and beef ribs, salmon, lamb, prime rib, chicken, turkey and more. BBQ isn't just great food, it's a day long activity to socialize with friends and family. The smells are hypnotic and you feel as though you are connecting with your American roots. It is truly a great way to reconnect with those you care for. It's not just about the food, it's about a day of fun, whether it's corn hole, horse shoes or just drinks and good conversation. I am also a trained Kansas City Barbecue Society judge, qualifying me to pass judgment on KCBS sanctioned barbecue competitions all over the U.S. and Canada. Brisket, chicken, ribs and pulled pork are my specialties. Proper BBQ techniques, cuts and varieties of meat, delicious side dishes, local and regional BBQ festivals, the history of BBQ, interviews with the best BBQ'ers in the business, equipment reviews, sauces and rub recipes, restaurant reviews, and don't worry. We will cover some grilling techniques and recipes as well. Be ready for free BBQ courses delivered directly to you via email, BBQ Pod Casts and possibly some online chats. Dave's barbecue newsletter is called "The BBQ Gazette." Through this occassional email newsletter you will receive BBQ and grilling tips, equipment, sauce and rub reviews, recipes and more! Sign up! This BBQ Blog is THE ONE to subscribe to. It is my goal to accompany each BBQ entry with a short and entertaining video to show how its done. 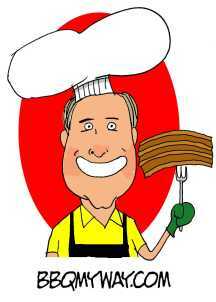 Click on this link to ask Dave a question about grilling or BBQ! Attend BBQ festivals for a great time! For the best beef recipes that have been tested by me personally, check out BBQMyWay.com. This BBQMyWay is the place to see recipes for barbecue pork, grilled pork and more. All types of barbecue chicken recipes, including beer can chicken, barbecue chicken pizza, slow smoked chicken and more. Interested in grilling fish or barbecue seafood of all types? This is the place to visit. Grilling Vegetables Is Not As Tough As You Think. Grilling vegetables adds a lot of variety to your menu, and keeps the mess out of the kitchen. I'll show you how to grill all types of vegetables, no come give us a visit! Looking to prepare your own barbecue sauce recipe? We've got you covered. check it out! Do you want to know what the best barbecue rub is? Maybe you want to make one yourself. BBQMyWay.com is the place to get it done. Side dish recipes that will compliment any main dish, whether a formal set down or an informal BBQ. Videos included. Grilling hamburgers properly can be tricky. Click here to learn the secret. An easy pulled pork recipe that you bbq on your Weber grill. Let Dave show you how! This turkey pot pie recipe is an excellent use of leftover turkey. Grilling turkey is easy and the end product is so much better than the typical oven roasted turkey. If you have a Weber grill, you can (and should) give this technique a try. This Hot Brown recipe is authentic, delicious and a great way to use leftover chicken or turkey. Fried Cauliflower Recipe That Rocks! This fried cauliflower recipe is an Italian version using a simple Paremsan cheese batter. It is really delicious! A roast chicken recipe that is authentic Italian, easy to do and most importantly, delicious. A "how to" video is included. This corn bread recipe for pancakes is awesome when used as a sandwich bun for pulled pork BBQ. Corn bread recipe included as well, and video included! This grilled chicken recipe is chicken kabobs in a spicy Thai peanut butter sauce with peppers and pineapples over a bed of rice. Includes video. Easy, sophisticated and most importantly, delicious. This section will show you how to grill a steak that is both smoky and delicious. This unique grilling method combines barbecuing and grilling methods. Video included. This is Liz's famous Deviled egg recipe. Instructional video included. This will become a traditional recipe in your family if they like Deviled eggs! Grilling Brats With Beer and Onions. Secrets Revealed! Grilling Brats or Bratwurst is easy when you know the secrets. Here they are revealed in an instructional video. This page will take you directly to my YouTube channel. Grilling pizza is fun, easy and delicious. Instructional video included! A corn salad recipe that is authentic, delicious and easy. This white chicken chili recipe is awesome! Instructional video included. This Cobb salad recipe is easy to make and is delicious! This fish stew recipe is easy and delicious. Instructional video included. This turkey noodle soup recipe is easy and delicious! Instructional video included. Some of Dave's favorite gift ideas for the BBQ entusiast in your life. Grilling lobster tails is easy and simple. Step by step video included. This stuffed hamburger recipe is fun and delicious! Is it a hamburger or a hot dog? Instructional video included. Homemade mac and cheese recipe that rocks! Instructional video included. Best apple crisp recipe that rocks! Easy, delicious, and an instructional video included.